Hello there! Today, I'm sharing a sweet Valentine's Day card using the adorable penguin from Polka Dot Orchard's Penguin Love digi stamp set. 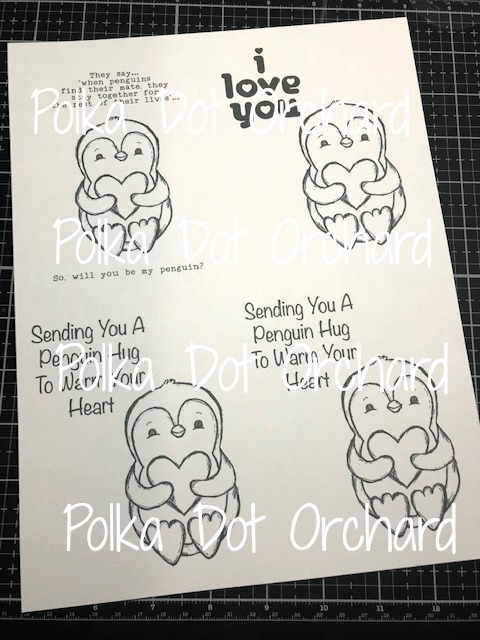 Just like my All You Need card from the other day using the same digi stamp set, I made card fronts using this sweet penguin and an assortment of sentiments right in a document so I could print these off and have 4 card fronts ready to color and create with. So, I had a few questions about the digi card fronts I created last time... I thought I'd share a picture to hopefully clear up any confusion. 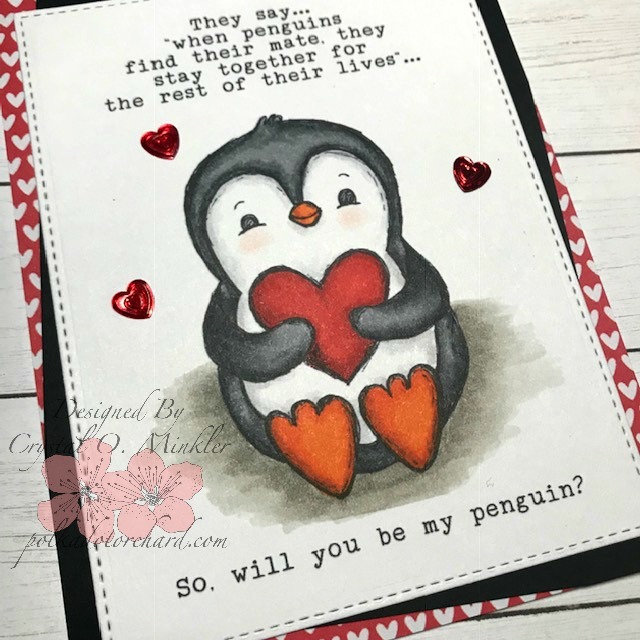 I resized the penguin and the sentiments to fit on a 8-1/2 x 11" piece of card stock. Once printed, I can trim them into card fronts measuring 4-1/4 x 5-1/2", color, and make into cards. Typically though, I keep them in a full sheet and do all of my coloring at once and then cut them into card fronts. I have found that my measurements in the document aren't always perfect so sometimes the images need to be cut smaller than a card front, but that's fine because I prefer to use pretty stitched dies to die cut them out. I hope this helps those that asked! Onto the card I created... I absolutely adore this penguin! How sweet is this little guy?! I colored him using the following Copic markers ~ N0, N1, N2, N5, N8, Colorless Blender, R000, R14, R27, YR15, YR27, YR68, W2, W5. I die cut the card front using a stitched rectangle die and adhered a few heart sequins. And then I started searching through my limited Valentine's papers... I really need more Valentine's papers! 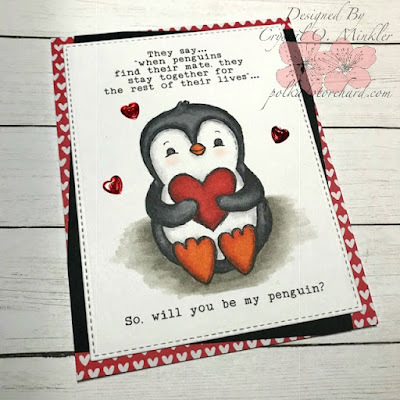 I chose the red and white heart paper from the My Funny Valentine paper pad by Pebbles. I adhered that to a white card base and got to thinking I wanted to mat the focal image... but I didn't want to cover up all the pretty hearts in the background. My solution to this was having my 'mat' off set a bit. I adhered the focal image to the off set black card stock and then adhered them to the card base. I was then able to trim off the edges of the card base - trimming off the excess black card stock. Here's a close up of the sweet penguin! So stinkin' cute! I hope that you like my card and found the information on my process for digi stamps informative. Be sure to check out this sweet digi stamp set in the Polka Dot Orchard Etsy shop!